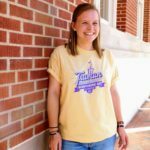 I initially chose to come to Truman because I was impressed with the numbers that compared well with other universities: average test scores, retention rates, job placements, rankings, degree programs, etc. I knew these statistics would provide me with a solid foundation of a well-rounded college education, and I was confident in my college choice. After arriving at Truman my freshman year, though, I realized that Truman has so much more to offer beyond our impressive statistics. We have a student body filled with individuals who inspire and motivate their peers, and a campus community that fosters life-long learning.